By now, I believe you all must have heard rumors that Apple is planning to launch three iPhone models in 2018. 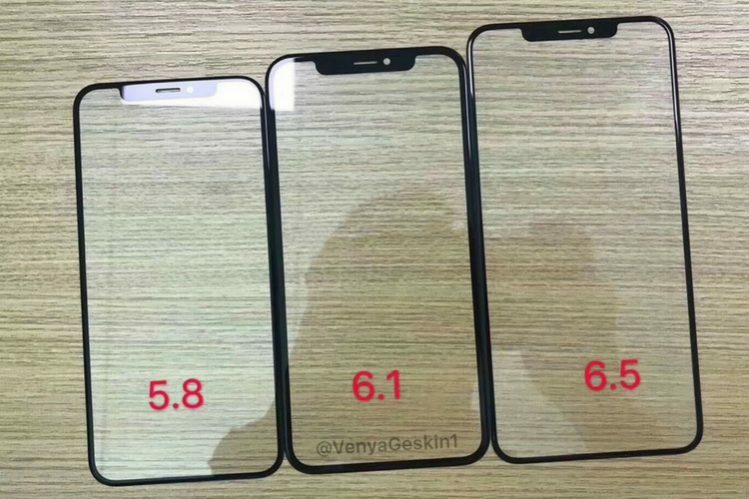 We’ve seen several leaks and speculations for the same over the past few weeks, but we have now got our first look at the front glass panels of the three iPhones. Thanks to well-known leakster Ben Geskin, we may now know what the upcoming iPhone models may look like from the front. The glass panels fall in line with previous leaks, where you can see two updated iPhone X models with an OLED panel and a third variant with an LCD panel. The devices you see below are the 5.8-inch and 6.5-inch OLED iPhones on the sides, with the 6.1-inch LCD variant sitting in the middle. And if you look closely, you will notice that the bezels on the LCD panel are thicker as compared to OLED ones since achieving the near bezel-less experience requires new technology. If this leak is deemed to be real, then one thing’s for sure – Apple is planning to totally part ways with its previous design and adopt the notched iPhone X aesthetic for all of the iPhone models going forward. Even the replacement for the low-end iPhone SE is now getting the notch treatment, however, it won’t exactly be the same as the pricier OLED iPhones. Based on the leaked glass panels, Geskin has also shared renders for the new, upcoming iPhones on his Twitter. These renders give you a closer feel at how the device will appear like in real life, where the difference in bezels is visible more clearly. However, one would prefer the 2018 iPhones over the Android clones that still have a significant bottom chin. As per some previous leaks, Apple has already invested in $2.7 billion in LG Display and is looking to source OLED display panels for its 2018 iPhones from them. The LCD panels, on the other hand, are expected to be produced by Japan Display (JDI). It would supply the 6.1-inch ‘Full Active’ LCD panels for the affordable iPhone model, which is poised to be the cheapest ($600) among the upcoming iPhone lineup.